The durable and convenient Pennsylvania EasyToFold state map will take all the wear and tear your journey can dish out. The heavy-duty laminated design allows you to mark your route, make notes, then wipe the surface clean for further use. This is a must-have for navigation whether you're a state resident or just passing through. National Geographic's Pennsylvania Recreation Atlas is the ideal resource for any recreation activity from hunting and fishing to camping, golfing, hiking, and more. This durable, easy-to-use atlas includes up-to-date topographic maps, a comprehensive road network, informative recreation guides, and a detailed index. All road types are clearly identified, making each atlas a useful planning tool for motorcycle and off-road adventures. Maps include bold boundaries for parks and federal lands, and clearly labeled lakes, rivers, and streams. On each map page you will find a convenient map legend, easy-to-read page numbers, a latitude and longitude grid for use with GPS, and fact-checked points-of-interest. Also included are cross-referenced charts of fishing areas with species information, game management units, campgrounds and attractions charts, state park maps and facilities, hiking, golfing, skiing and paddling destinations, climate information, and more. Whether traveling for business or leisure, National Geographic's Pennsylvania Guide Map is an essential travel companion. Coverage is unparalleled with a comprehensive road map, combined with more than 10 inset maps detailing cities and metropolitan areas, including Philadelphia, Pittsburgh, Allentown ? Bethlehem, Allentown, Reading, Scranton ? Wilkes-Barre, Lancaster, Harrisburg and others. Roads are labeled according to usage and hundreds of points of interest, national and state parks, national forests, campgrounds, visitor centers, airports, ski areas and hospitals are pinpointed. To find your destination quickly, use the convenient index of counties, cities and towns. Visitor information is given for Philadelphia and Pittsburgh, as well as Gettysburg National Park and Amish Country scenic drive, all of which have accompanying inset maps. Descriptions and contact information are provided for many popular points of interest, a calendar of events and national parks which are listed in a chart with their available services. Rand McNally's Easy To Read State Folded Map is a must-have for anyone traveling in and around Pennsylvania, offering unbeatable accuracy and reliability at a great price. Our trusted cartography shows all Interstate, U.S., state, and county highways, along with clearly indicated parks, points of interest, airports, county boundaries, and streets. 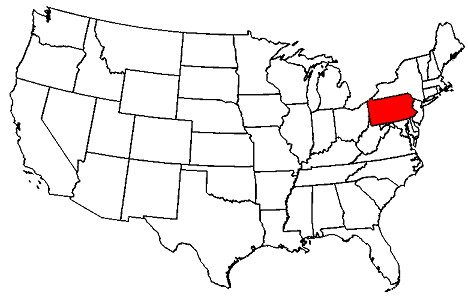 This map of Pennsylvania State is durably laminated and contains extensive coverage. Laminated maps are easy to fold, write on, and wipe off. 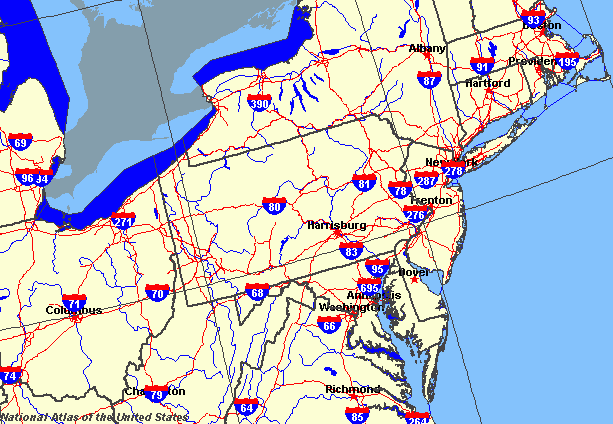 Coverage includes detail Insets of: Allentown, Bethlehem, Downtown Philadelphia, Downtown Pittsburgh, Harrisburg, Philadelphia Vicinity, Pittsburgh Vicinity & Scranton; and features: Airports, Interstate Exit Numbers, Longitude & Latitude Information, Parks & Rec Areas, Pennsylvania Facts, Places of Interest, Scenic Routes & Ski Areas. 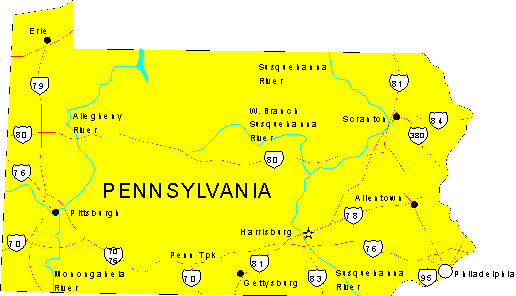 Map of the state of Pennsylvania including insets of: Altoona, Erie, Johnstown, Greater Philadelphia, Greater Pittsburgh, Scranton/Wilkes-Barre, Southeast Pennsylvania, Sharon and State College You will also find: cities/villages/townships, major roads/highways/interstates, parks, state gamelands, recreation areas, historic sites, points of interest Fully indexed 38″ x 25.5″, pub. 2012.